We handle all aspects of maritime injury at sea... including shore side situations. 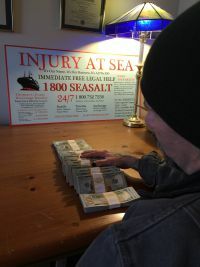 Our Seattle Maritime injury attorneys have provided legal representation worldwide for injured fishermen, deckhands, officers, merchant mariners, factory trawlers, crabbers, ferry workers, longshore, all branches of the merchant marines, cruise ship, oil rig workers and recreational boater injuries. We work with highly qualified marine safety investigators, naval experts, injury experts, Board-certified medical personnel and health care providers, physical capacities experts, and job experts, representing anyone injured at sea or in a maritime situation, to get compensation for present and future losses. Maritime injury is all we do. So Lucky to be alive, Saved by an angel. Over the years, we have grown accustomed to asking our clients surviving near death experiences whether they saw "the light" – the brilliant white light some say they see just as they are about to die. Sometimes our clients elect to take their settlements in cash. Here, a very experienced crabber/longliner suffered back problems and we resolved his case within a few months, with a cash money settlement well into the six figures. The day of receipt of his settlement he was back under contract, going back to work in the Alaska fishery, with an enormous amount of tax-free cash in his backpack. We helped him find the best medical care, obtained a settlement promptly, got him right back to work once his settlement was final and sent him on his way with money to last for a very very long time. You can’t see the smile on his face in this photo, but we will tell you, he is one very happy camper! We serve the following localities: Anchorage, Juneau, Kenai Peninsula Borough, Homer, Kenai, Soldotna, Kodiak Island Borough, Kodiak, Benton County, Corvallis, Clackamas County, Portland, Clatsop County, Astoria, Seaside, Coos County, Coos Bay, Myrtle Point, Deschutes County, Bend, Clallam County, Port Angeles, Douglas County, East Wenatchee, Grays Harbor County, Aberdeen, King County, and Seattle.